With his poll numbers ticking up, he is planning trips to Iowa and New Hampshire. The South Bend mayor, a Rhodes scholar and Afghanistan War veteran who has been essentially campaigning since January, has joined a dozen-plus rivals vying to take on President Trump. 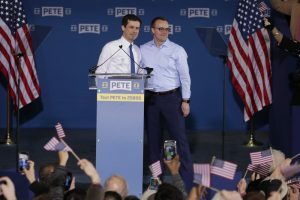 The hulking, dilapidated factory loomed over the city for much of the past 60 years as what Buttigieg called a daily reminder of South Bend’s city’s past. Partially remodeled, it’s now a mixed-use mixed-use technology center outside downtown – and the setting for Bettigieg’s announcement.